Home » Uniforms of Independent Company Organizations. Uniforms of Independent Company Organizations (1775-83). American Revolutionary War. Some of the independent companies of the cities were uniformed. In Connecticut, the Governor’s Foot-Guard, and organization still in existence, wore, as it still wears, scarlet coats, bear skin hats, and brown gaiters. A soldier of this command and one of the City-troop of Philadelphia, also still existing, a Virginia rifleman, and a Minute-man, are shown in Plate I. The trooper is dressed in brown coat with white facings, white breeches, high boots and round leather cap with a buck’s tail and a silver cord. 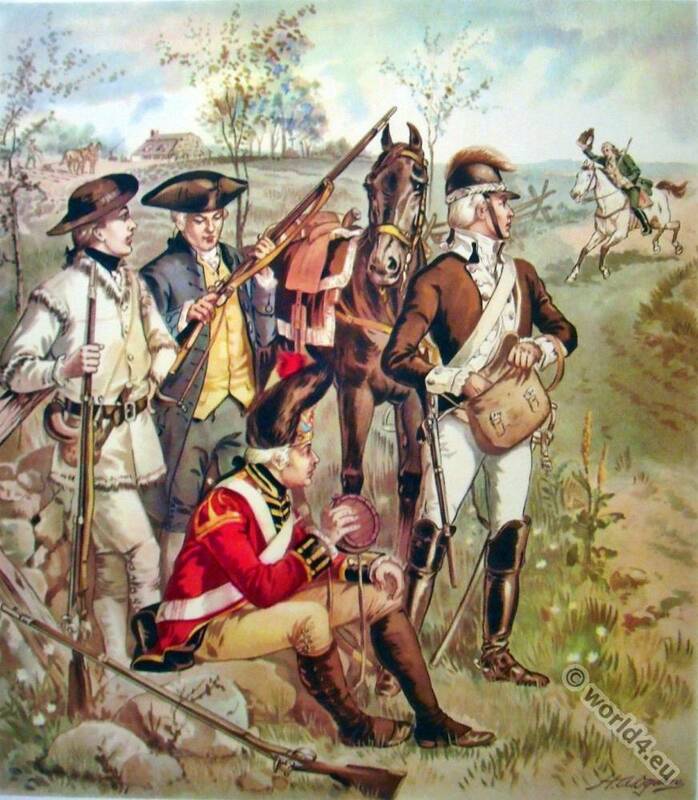 Brown was a favorite color for military coats in colonial days and during the Revolution. It was ordered by the Continental Congress, and it was adopted by several colonies. It was a favorite color among the Quakers of Philadelphia, and because it was in demand, and because the dye was obtainable on every farm, brown was the prevalent hue of cloth manufactured in this country. 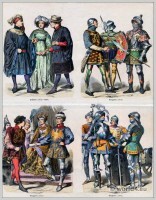 Source: Uniforms of the United States Army 1774 to 1889 by Henry Alexander Ogden (1856–1936). Ed. ; Washington D.C.: Brig. Gen’l S.B. Holabird. Published by B.M. Whitlock, N.Y. 1889. A Spahi. 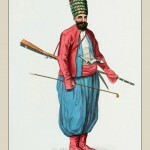 Ottoman Empire Cavalry. 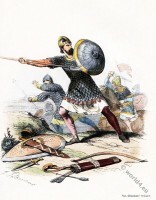 Armed infantry warrior in brigandine. France 10th century.